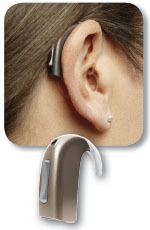 There are many styles of hearing aids. The degree of hearing loss, power and options requirements, manual dexterity abilities, cost considerations, and cosmetic concerns are some of the factors that will determine the style that is right for you. Our Doctors of Audiology will work together with you to find the best fit for you and your lifestyle. See below for a few examples of the different styles we offer at Island Audiology. Many different accessories are available to enhance your listening experience with hearing aids. Most hearing aids can now stream audio signals from your cell phone, land-line phone, digital music player, and television through a separate device. A small companion microphone is also available to help ease conversations in challenging listening situations. We accept the following methods of payment: Cash, Check, Credit Card (MasterCard or VISA), and Financing through Wells Fargo with approved credit. The Wells Fargo Health Advantage credit card* offers special financing options for your hearing devices and/or accessories.